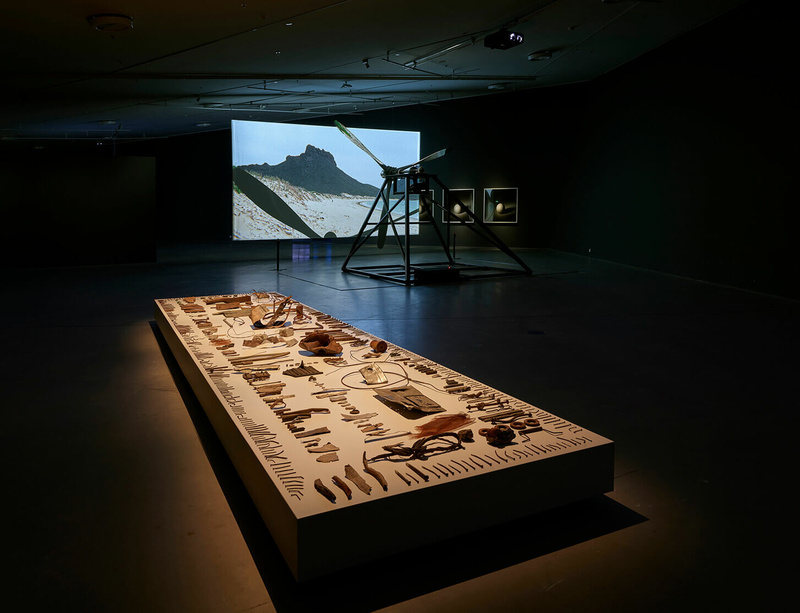 The Eye Filmmuseum in Amsterdam, the Netherlands, has opened a major group exhibition, ‘A Tale of Hidden Histories’, which explores how stories are shaped around war and conflict through the work of four prominent artists including Adam Broomberg & Oliver Chanarin. The works on display by Broomberg & Chanarin, Omer Fast, Chia-Wei Hsu and Meiro Koizumi shed light on the history of conflict zones from multiple perspectives through film and video, slide projections, photographs and sound installation. Through their investigations into collective cultural memory, these artists ask questions around the representation of history, the depiction of war, and the artist’s role in this arena. Broomberg & Chanarin present their 2014 work Dodo - an installation centred around the remains of a B-52 bomber aircraft, that was retrieved from the filming site of Hollywood’s 1970 adaptation of Catch-22 by Joseph Heller. The small Mexican coastal town of San Carlos was left with a drastically changed infrastructure upon production ending in the late-1960s. Named after the first species on Earth to be made extinct as a result of human activity, Dodo displays the remnants of the aircraft with offcut footage from Catch-22 that documents San Carlos’ landscape and wildlife on the brink between isolation and urban development. ‘A Tale of Hidden Histories’ runs until 19 May. Read more about the exhibition via the Eye Filmmuseum’s website.